In today’s unified commerce environment, retailers are inundated with massive amounts of data from multiple sources every day. Success depends on their ability to interpret and act on this data quickly and accurately. Faster is decidedly better. 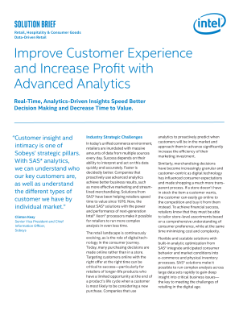 Companies that proactively use advanced analytics achieve better business results, such as more effective marketing and streamlined merchandising. ...Solutions from SAS* have been helping retailers speed time to value since 1976. Now, the latest SAS* solutions with the power and performance of next-generation Intel® Xeon® processors make it possible for retailers to run more complex analysis in even less time.